Let’s Take a Hot Air Balloon Ride! Well done, Kid Whisperer! What a great way to give lessons full of information! I especially liked the one on Spanish Moss! I have just enjoyed the experience of a lifetime! Thank you, Kid Whisperer, for a thrilling ride! Welcome to The Kid Whisperer's Energize Yourself blog. 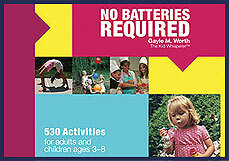 You'll find exciting tips and activities that children and parents can do together based on the book, No Batteries Required. Seen on the NBC 10 Show: Demonstration of summer activities from the book. Filed by Lesly VanArsdalle on CBS.